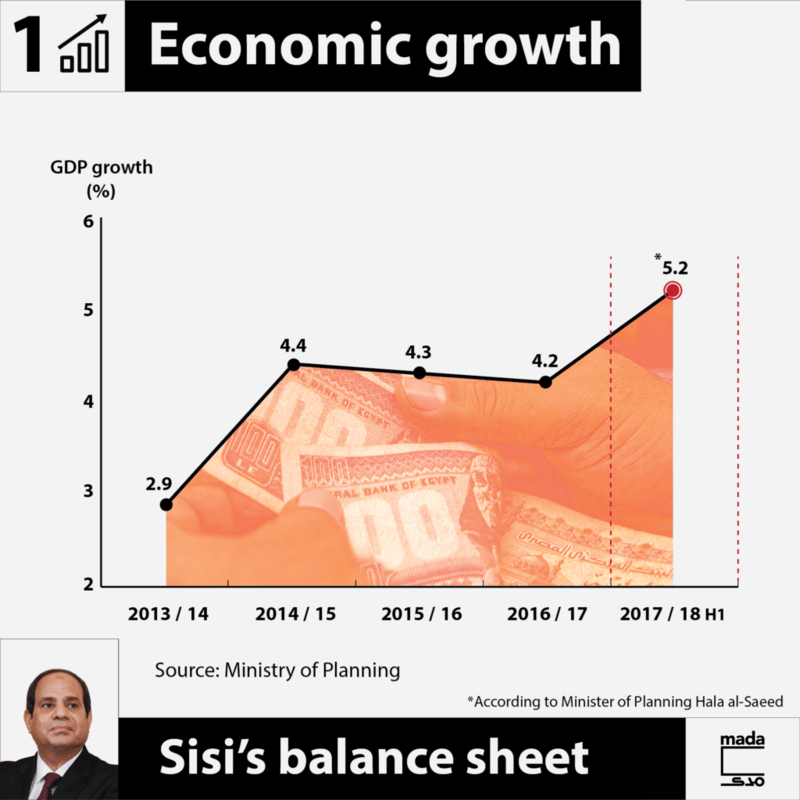 As President Abdel Fattah al-Sisi comes to the end of his first term in office and stands on the brink of a likely second term, Mada Masr has created infographics that break down some of the main indicators of Egypt’s macroeconomic performance over the past four years. Put together using government figures announced throughout this period, some of the infographics point to successes by the state. Others, however, don’t live up to the state’s projections. 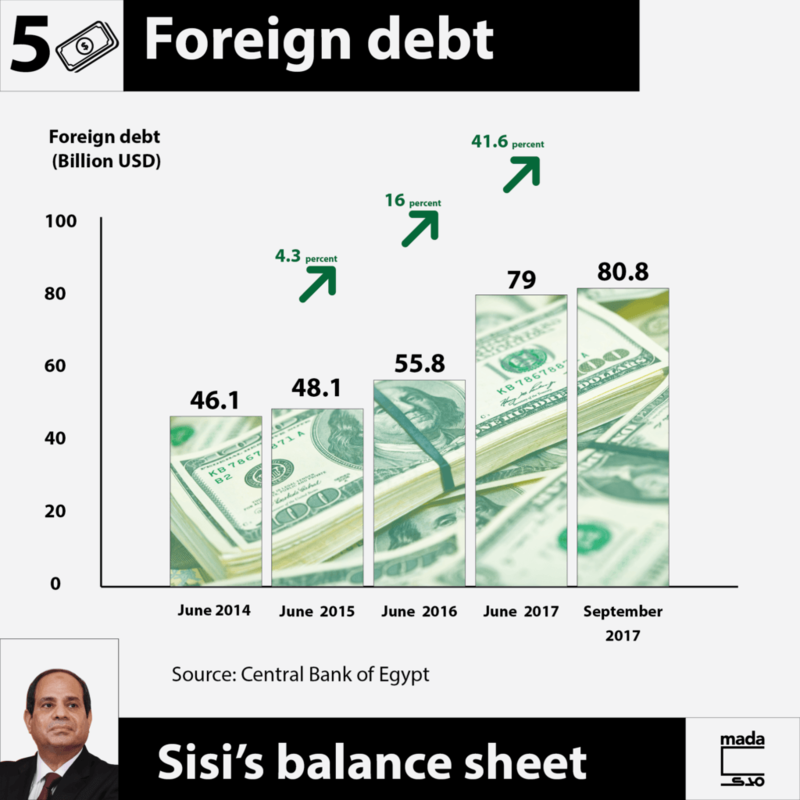 That said, economic indicators do not tell the whole story of Egypt’s political economy over the past four years. Firstly, they do not accurately capture the actual negative impact that the government’s policies have had on the lives of many Egyptians, nor do they give a sense of whether the positive impacts were equitably distributed. 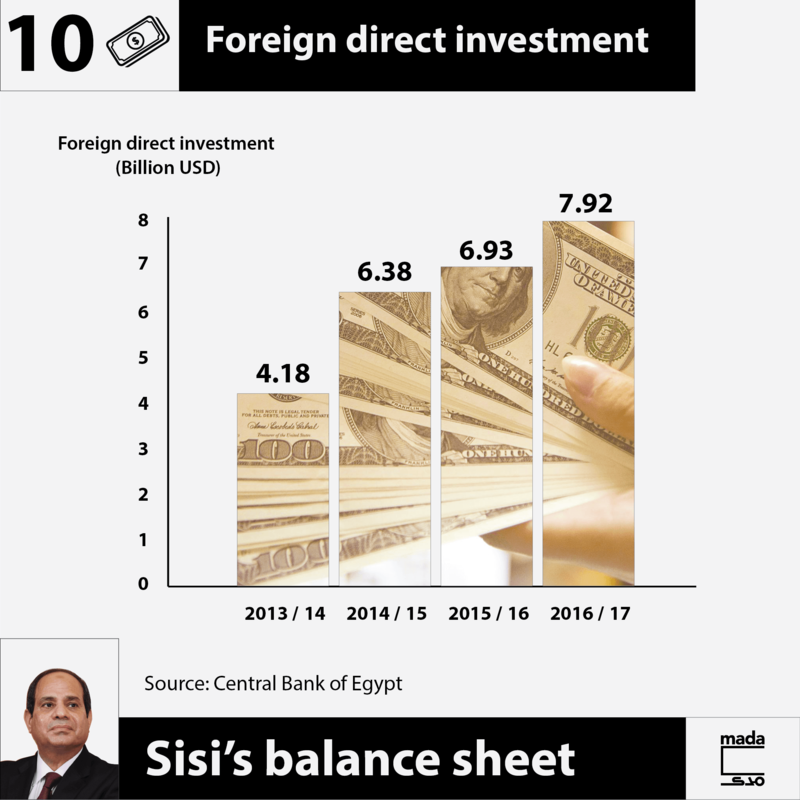 Secondly, the indicators do not clarify whether the government’s overall economic policy is geared toward real development, or more toward attempts at improving these indicators in an incoherent manner, without resolving Egypt’s chronic economic problems. 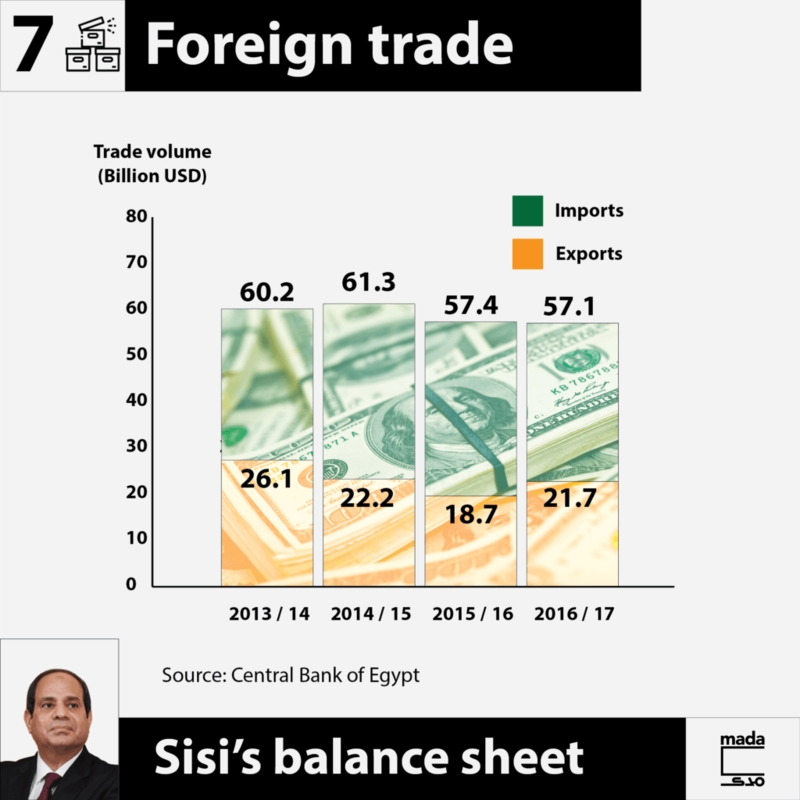 Given these limitations, Egypt’s economic performance during Sisi’s first term in office was defined by a rise in economic growth and a notable increase in foreign currency reserves, developments the government had promised it would secure. However, these positive indicators were funded by a substantial increase in domestic and foreign debt. 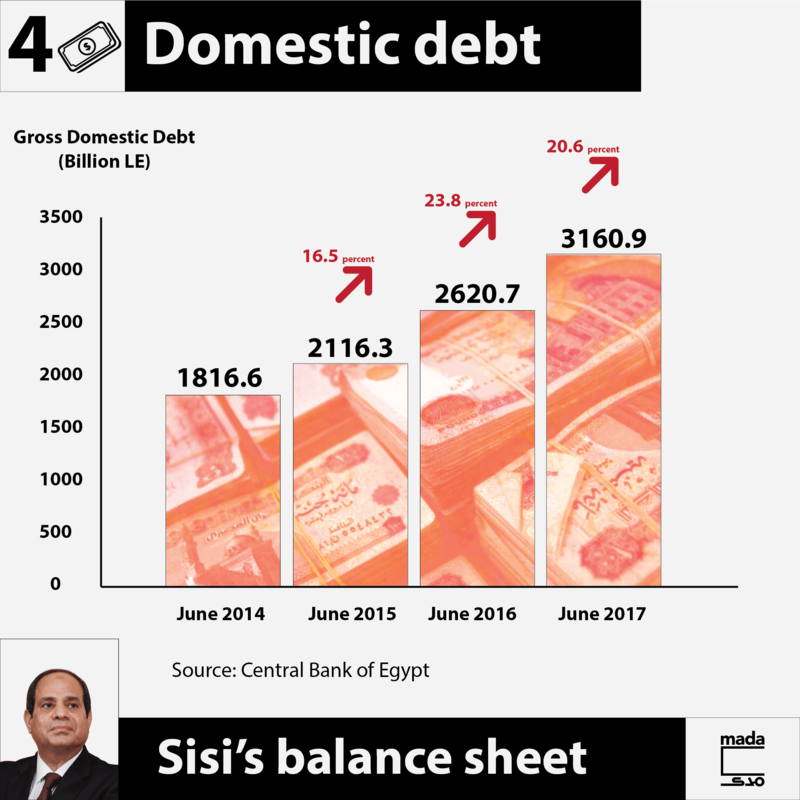 During Sisi’s presidency, domestic debt rose by 74 percent and foreign debt by 75 percent. The significant uptick in debt wasn’t balanced by any structural changes in national production, a significant rise in job creation or improvements in healthcare and education, which points to the use of these debts in areas that lead to development in the medium and long term. 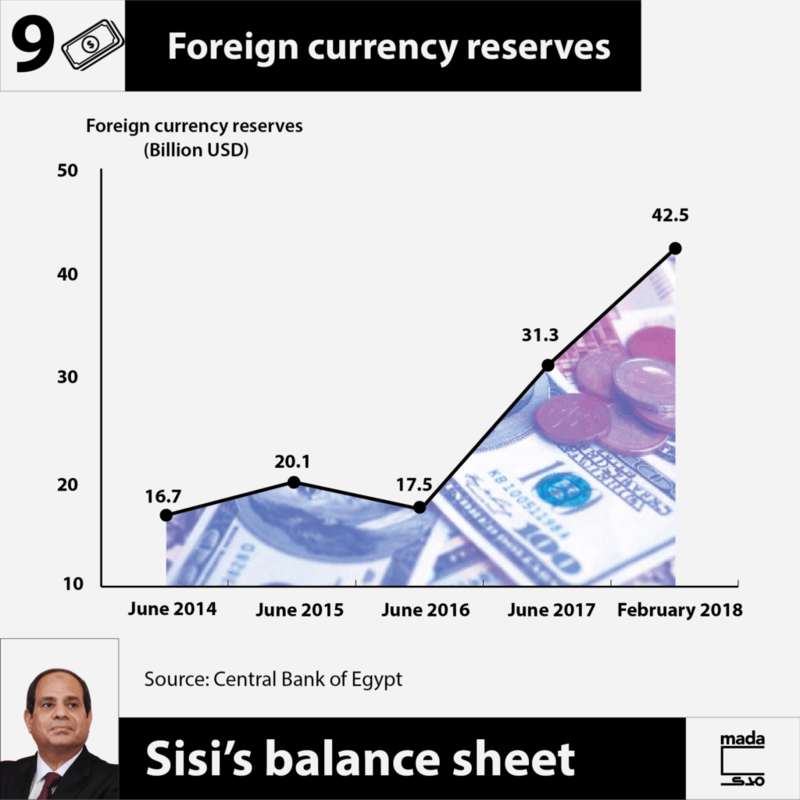 The state was able to resolve its foreign currency crisis with the aid of foreign debt and the devaluation of its currency following the liberalization of the exchange rate in November 2016. 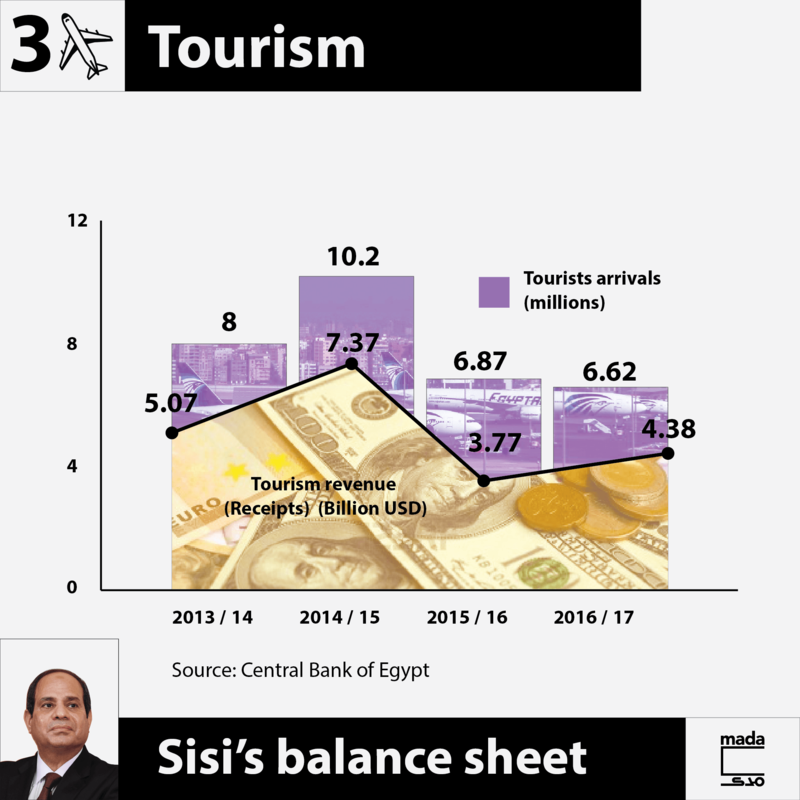 But there were not significant improvements for Egypt’s sources of foreign currency during Sisi’s term, as tourism revenues did not return to the levels they had been at before his term began in May 2014, nor did exports reach the levels the government forecast would be achieved due to the devaluation. 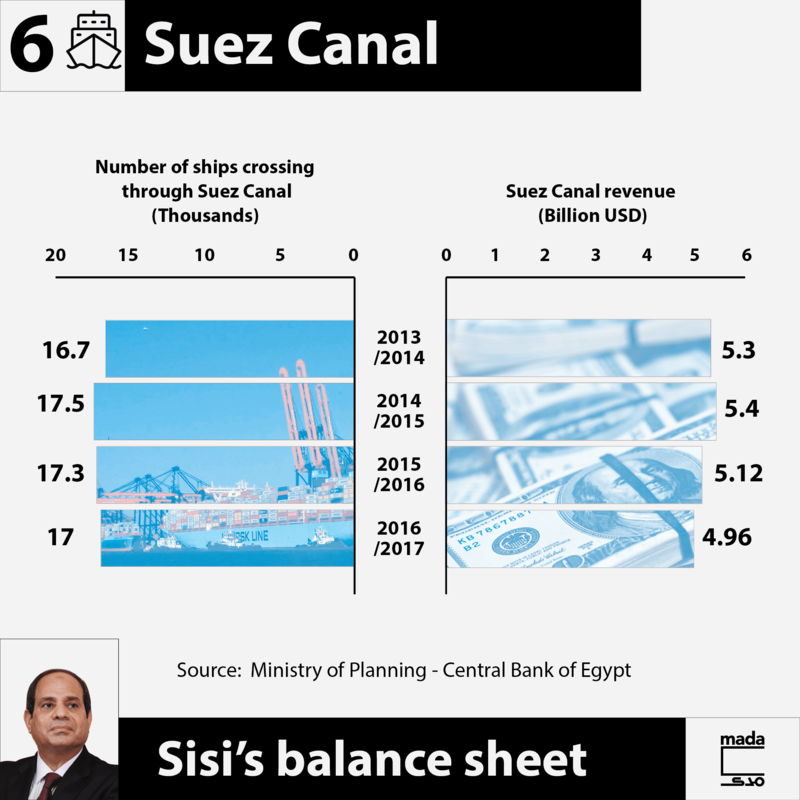 Revenues from the Suez Canal have decreased during the past four years, despite promises that they would increase after the its expansion project was inaugurated in August 2015. 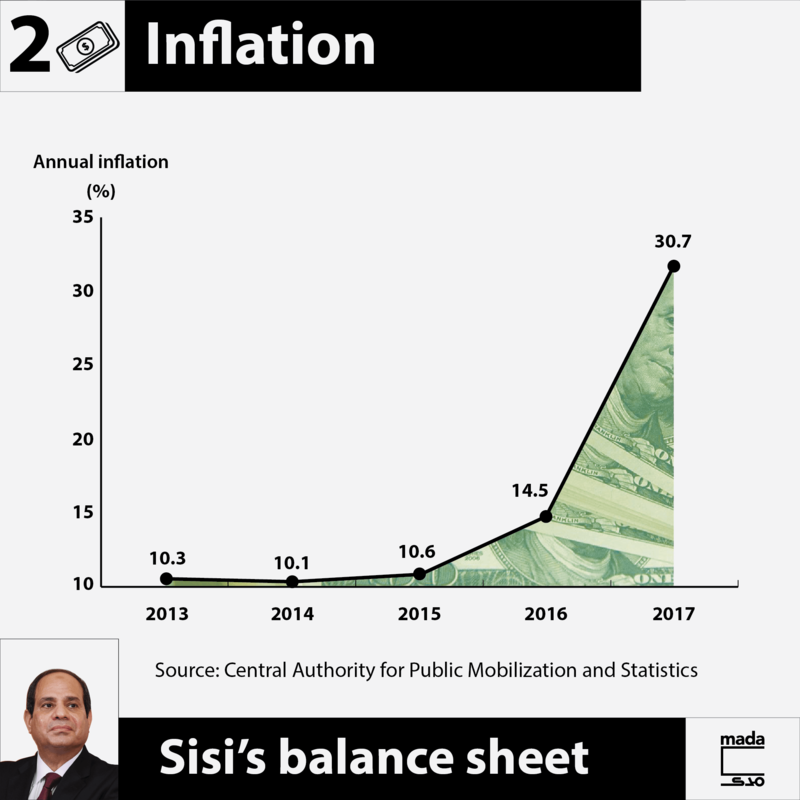 The most prominent indicator was inflation, which soared during the last year of Sisi’s current term, and which is one of the most telling indicators of the sweeping effects that the president’s policies have had on Egyptians’ lives. Inflation rates also obscure the groups most affected by them, however. While average inflation was 30.7 percent in 2017, some goods and services have seen price increases of over 100 percent. And while the government has trumpeted the decline in inflation rates since the beginning of the year, the dip doesn’t mean prices have gone down or that citizens are managing with high prices, even if they’re not rising as sharply as before. 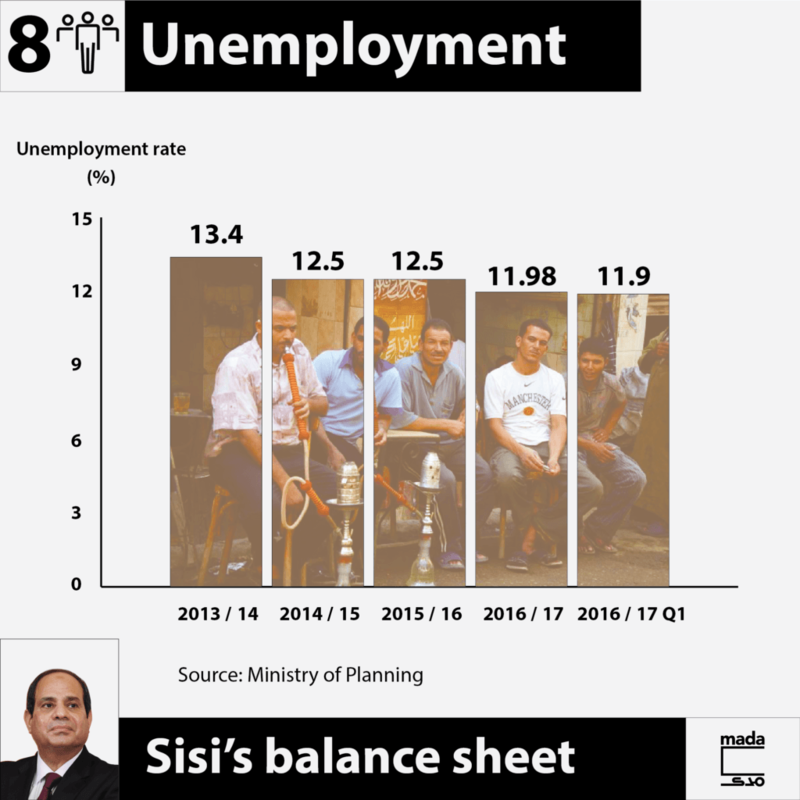 Do economic indicators reflect reality for most Egyptians? 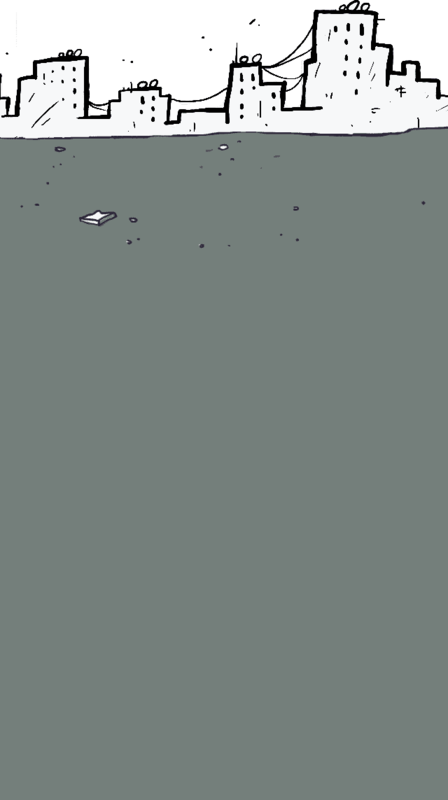 How to cover a post-shock economy?